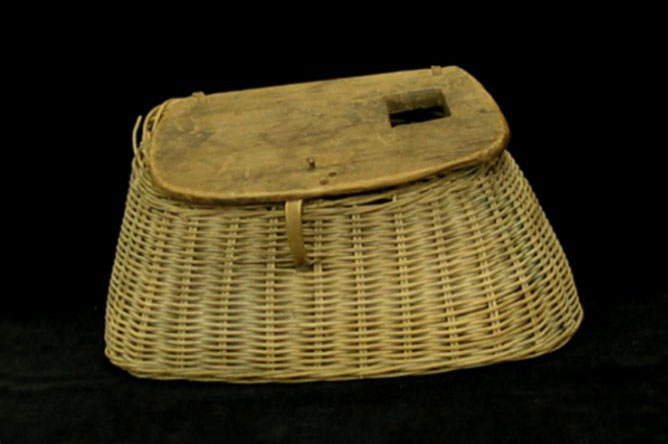 This wicker fishing basket was used to keep fish fresh during transport. 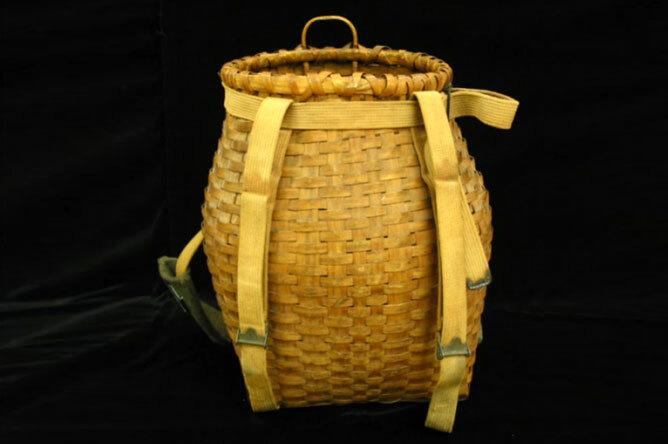 This ash fishing basket could be worn like a backpack and had a larger capacity. Paul Messier proudly displays a freshly caught Walleye. 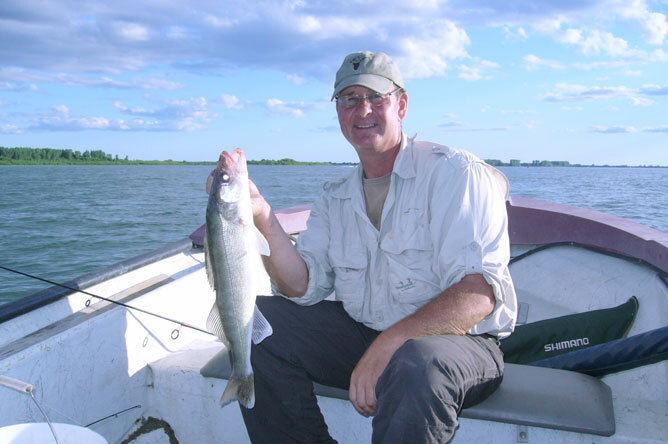 In the summer, we would catch two or three walleye every evening, walleye that weighed three pounds. Sometimes we would also land a pike—but those fish can bite your fishing line in two. We caught loads of perch as well. Those were good times. Between 1928 and 1931, the Department of Marine and Fisheries built five overflow weirs in the Lake Saint-Pierre archipelago as part of a project to raise water levels in the river up to the Port of Montreal. The weirs are situated between the following islands: (1) Île aux Barques and Île du Moine, (2) Île de Grâce and Île Ronde, (3) Île Ronde and Île Madame, (4) Île Saint-Ignace and Île Dorvilliers and (5) Île Dorvilliers and Île du Milieu. 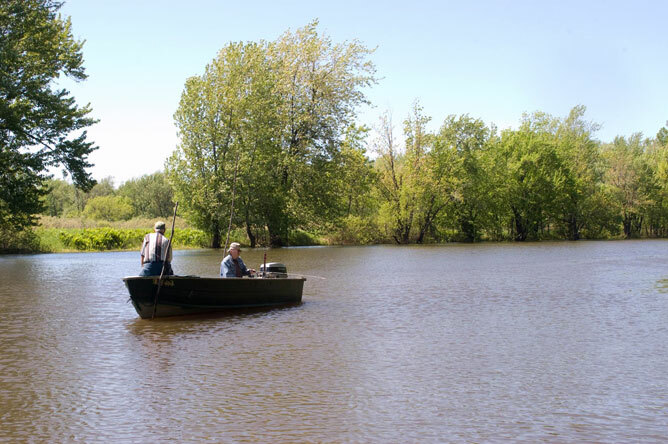 People often stand near the weir, along the Grand Chenal, to fish for Walleye. 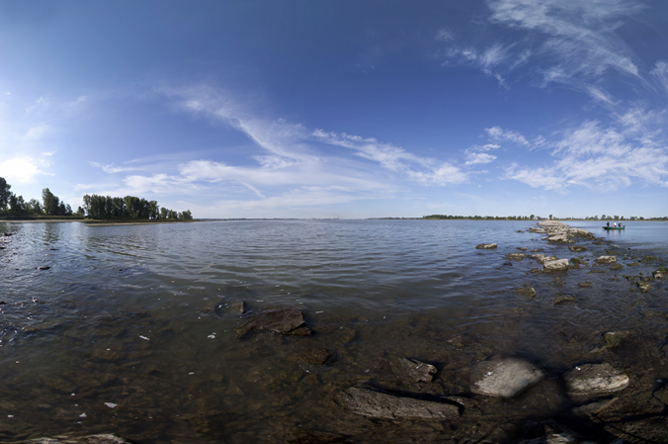 Panoramic photograph taken from the overflow weir between Île Ronde and Île de Grâce. Île Ronde is to the left of the fishermen and Île de Grâce is to the right. Baie de Lavallière was drained and converted to farmland in 1938. The Quebec government eventually decided to restore this exceptional wildlife habitat to its original state, and work was carried out from 1983 to 1987 to re-flood 900 hectares of land. The restored wetlands of Baie de Lavallière are an ideal spawning ground for many species of fish. The Société d'aménagement de la baie Lavallière (SABL) monitors fish populations in the bay. A total of 27 species have been observed, including Bullhead, Yellow Perch, Northern Pike, Pumpkinseed, Black Crappie, White Sucker, Central Mudminnow, German Carp, Golden Shiner and Bridle Shiner. 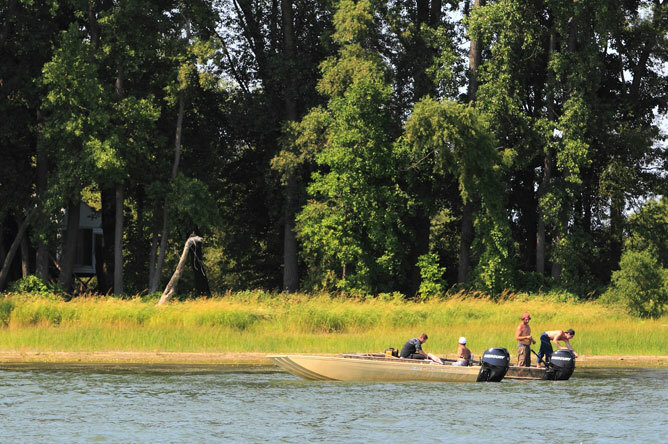 The bay is an important breeding ground for early-spawning fish such as the Northern Pike and Yellow Perch. Paul Messier, director of the Société d'aménagement de la baie Lavallière and wildlife technician, sets up a hoop net. A small Yellow Perch is removed from a hoop net. 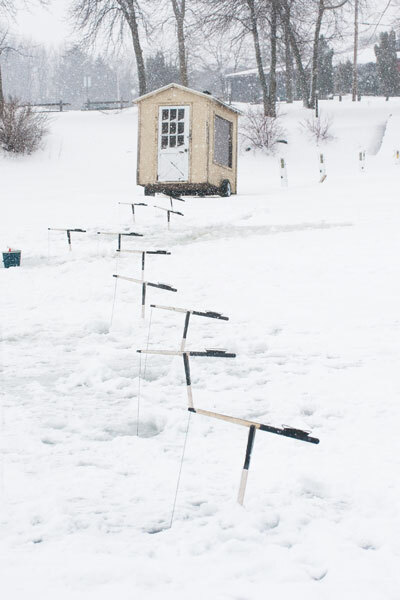 Fishing is practised in all seasons. 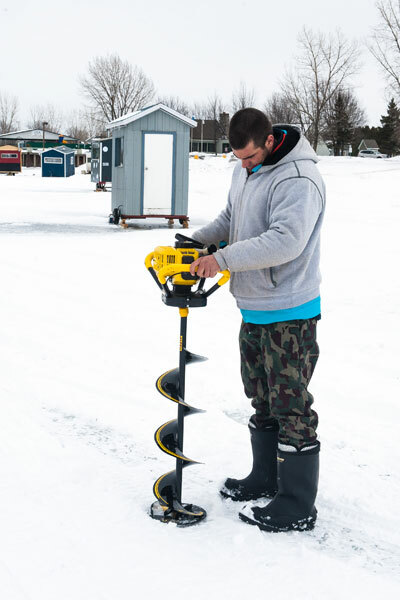 Winter is the season for ice fishing. 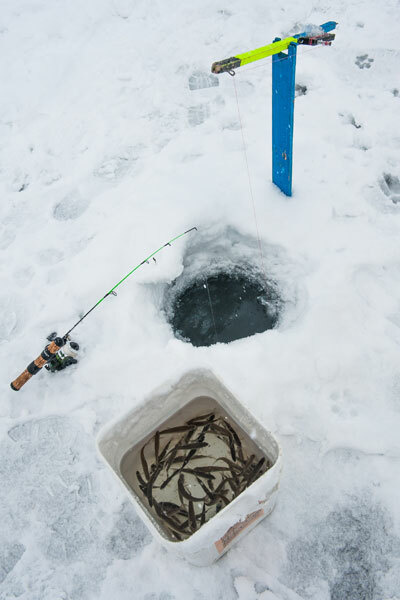 The fisherman bores a hole in the ice and lowers a baited hook through it. 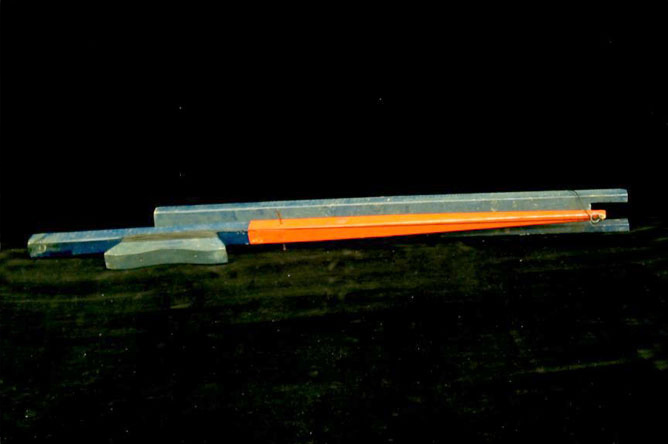 The line is held in place by a tip-up, which moves when a fish bites the hook. The main species targeted are Northern Pike and Walleye. 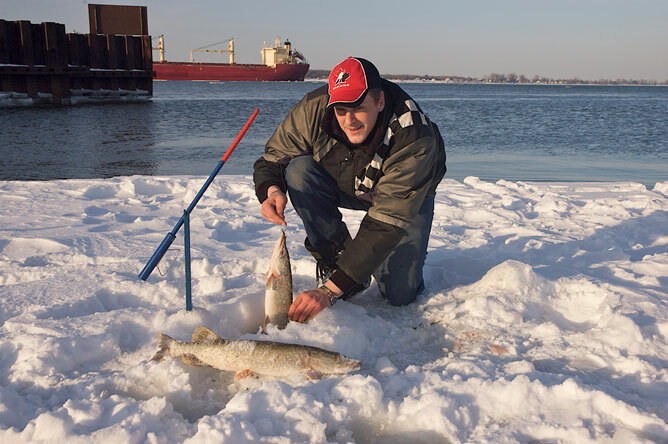 This fisherman caught two pike while ice fishing in front of Regard-sur-le-Fleuve park in Sorel-Tracy. 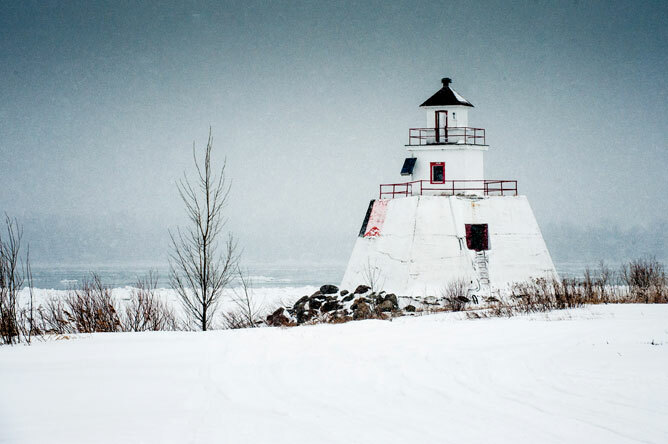 As you look at the lighthouse on Île du Moine in the heart of winter, it can almost feel like time is standing still. But on the frozen channel, you can see many people busying themselves around their colourful cabins and trailers. 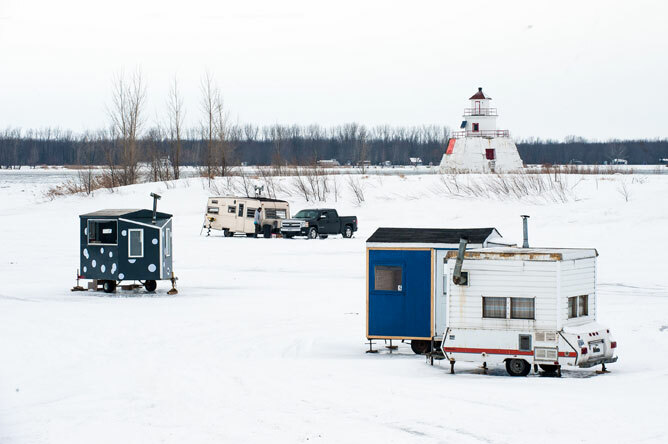 While the adults set up their ice fishing rigs, the children sled down the banks of Île du Moine. The festive ambiance seems to warm the chill winter air. Paul Cormier of Sainte-Anne-de-Sorel bores a hole through the ice. He then places a tip-up on the edge of the opening, and baits the line with a live shiner. Then, he lowers the hook and line into the hole. Each fishing licence allows its holder to set up to ten tip-ups. 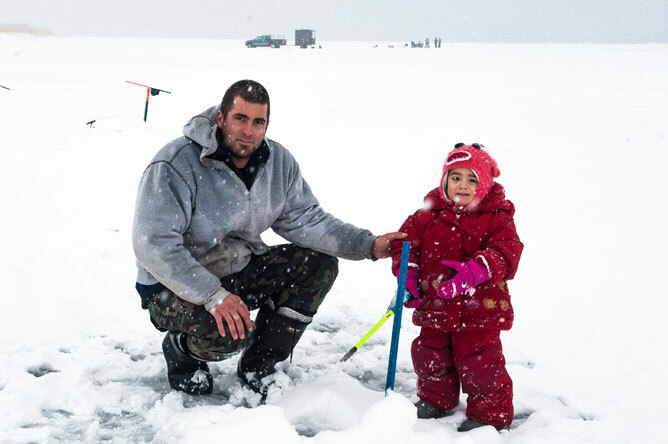 Maélie is barely two and a half years old, but she is already learning the basics of ice fishing from her father. 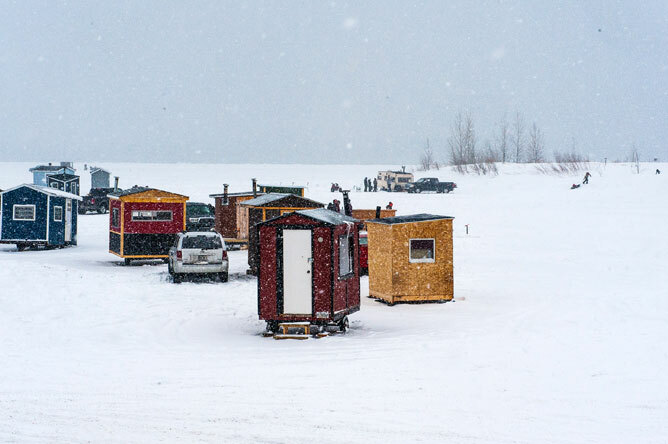 In the Lake Saint-Pierre region, people are passionate about this outdoor sporting activity. 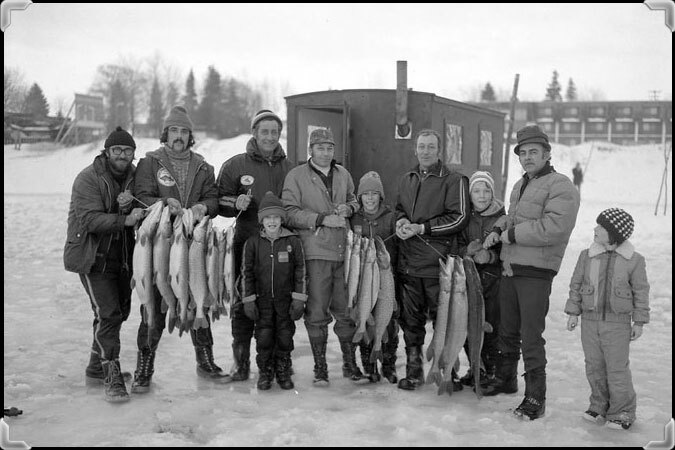 Men and children pose with the numerous pike they have landed over the course of a day. The photograph will be a great souvenir of this productive fishing excursion. Fishermen on the frozen St. Lawrence River by the Auberge de la Rive hotel; probably taken in the 1970s. This wood and metal tip-up is 66 centimetres long and 10 centimetres wide.